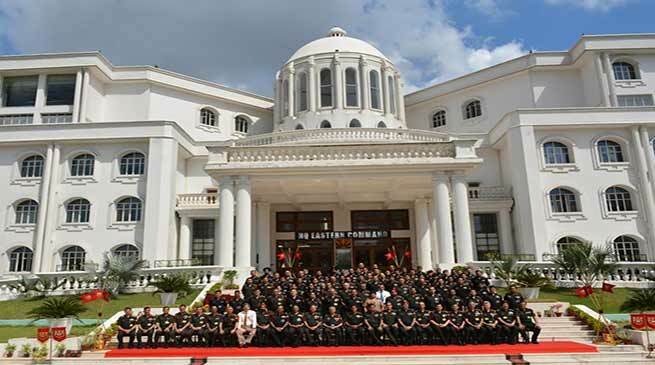 Headquarters Eastern Command of India Army celebrated its 98th Raising day on 01 November 2018. The command was formed on 01 November 1920 at Nainital under General H Hudson, with territorial jurisdiction over Delhi, UP, Bengal, Bihar, Odisha and Assam. Thereafter owing to operational commitments the Command Headquarters shifted to Barrackpore, Ranchi and Lucknow before permanently settling down in Fort William Kolkata post the Sino Indian Conflict in May 1963. Eastern Command as the guardians of the East has been involved at every level to bring in meaningful changes in the lives of the people through Operation Sadbhavana and Operation Samaritan schemes which have a left a deep impact on the lives of the local population. A total of 350 such projects encompassing all spheres of welfare activities like construction of infrastructure, creating awareness and educating the common masses on various issues including imparting training on Skill Development have been undertaken this year. Eastern Command has also been at the forefront of Flood Relief in Tripura, Manipur and South Assam rescuing and providing assistance to over 4000 people in June this year and rescuing over 300 tourists from the earthquake affected parts of Sikkim. Be it Humanitarian Assistance and Disaster Relief operations or as the last bastion to restore law and order, the Command has acquitted itself in an exemplary manner reinforcing the Nation’s faith in the Army. On this momentous occasion, a wreath laying ceremony was organised wherein Lt Gen MM Naravane, AVSM, SM, VSM, GOC-in-C Eastern Command paid tribute to the martyrs. He wished all Ranks and Civilian Defence employees on the occasion of 98th Raising day and called upon everyone to continue working with dedication and devotion in the true traditions of the Indian Army.